Day 7: It’s all about the Sea(food)! After arriving the night before from our various embarkation points, we gather for breakfast at the Taj’s delightful Shamiana. Special guest chef Floyd Cardoz worked at the start of his career at an earlier incarnation of Shamiana. The Taj has a long history of cultivating culinary talent and embracing food and beverage as central to the customer experience. 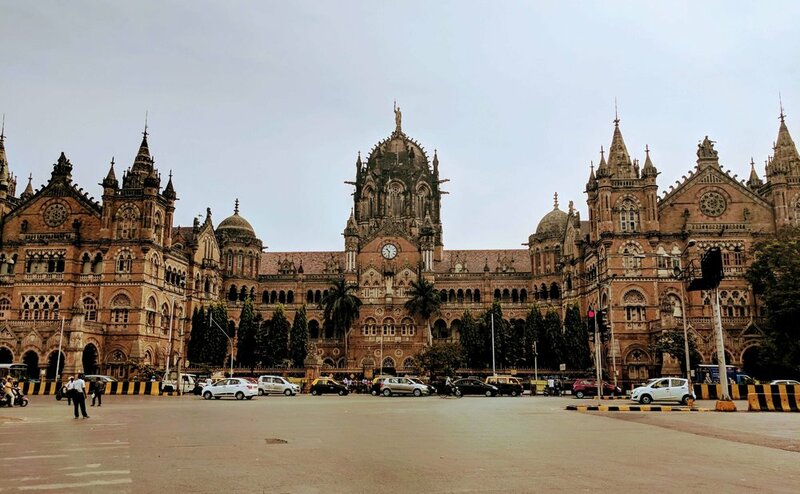 We head out on an architectural heritage tour of Mumbai led by one of the city’s most animated storytellers and history buffs. We will pass through the areas of Colaba, Fort, Kala Ghoda, Marine Drive, Nariman Point, Malabar Hill, or what some fondly refer to as “SoBo”. 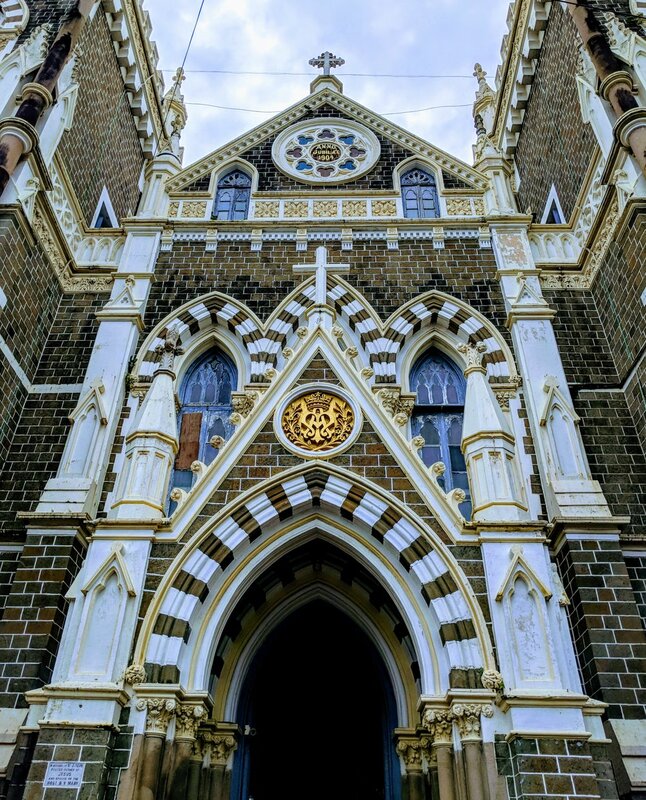 Mumbai’s heritage architecture is a fusion of foreign and Indian aesthetic traditions and references that have created an idiom unique to this city. Such diversity and creativity also characterize Mumbai’s foodscape in which the whole of India can be sampled. For lunch today we have chosen to sample vegetarian Gujarati thali at Shree Thaker Bhojanalay. We climb a set of stairs in a nondescript building in the middle of a bustling working neighborhood to ascend to gustatory heights of pleasure at this “working man’s canteen” established in 1945. 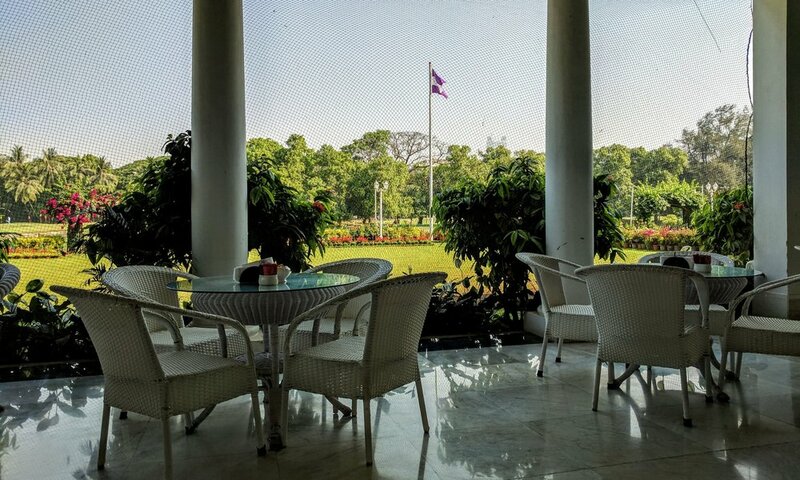 After lunch and before dinner, our guests are free to pursue cultural activities, such as museum and gallery visits, take a dip in the glorious Taj pool, or perhaps enjoy a nap. 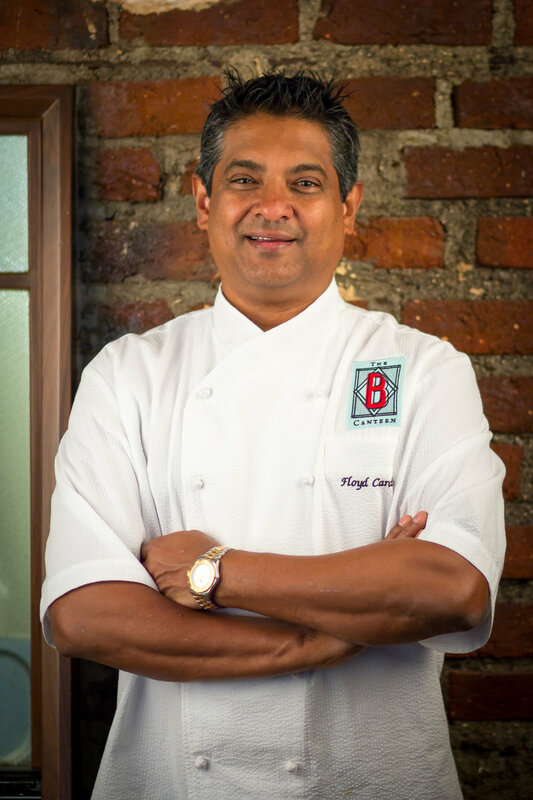 Several years ago, Floyd and his business partners dreamed of creating a dining experience in Mumbai that would reimagine Indian food in all its regional glory with bold flavors and seasonal ingredients – all within a fun and festive environment. Since the opening of Bombay Canteen in 2015, these aspirations have not only translated into a rousing success but have also elevated the interest in innovative regional Indian cuisine across the country. Often cited on every “best of” list, Bombay Canteen is our venue for a special dinner hosted by Floyd and CIA-trained Executive Chef and partner, Thomas Zacharias. Savory dessert snack? Should anyone still have the energy and room in their stomachs, Floyd plans to make a quick visit to the iconic food stall near the hotel, Bademiya, which is said to have popularized the seekh kabab. After a good night of sleep and breakfast at the hotel, we head to the verandah of a local old-world establishment in bustling Tardeo. 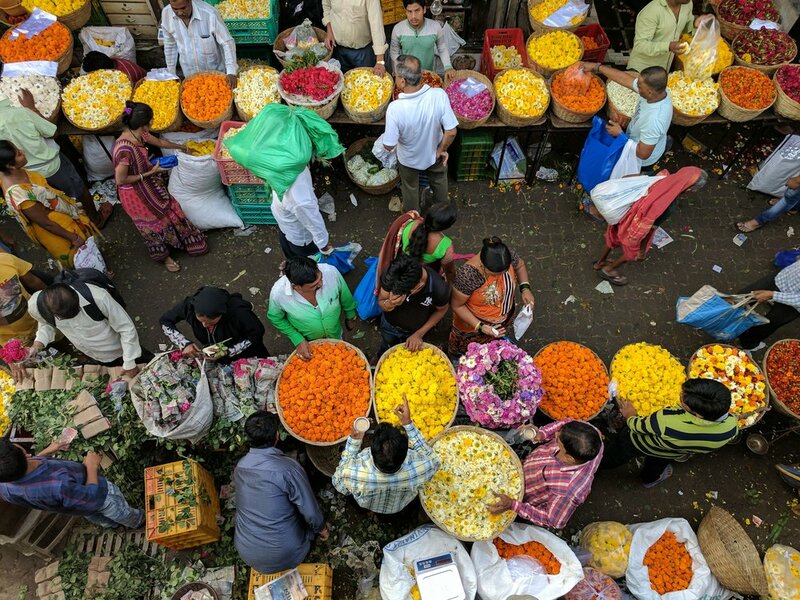 As we sip tea and munch on Eggs Kejriwal, Floyd previews our upcoming tour through some of Mumbai’s produce, herb, flower and spice markets. Floyd will guide us and all our five senses through these mazes of magnificence. We will spend some time in the Lalbaug spice “gully” for a lesson in mirchi, kesar, jeera and haldi plus chili, chili and more chili. Choose the spices you like, have them roasted, ground and made into your own masala. We return to Colaba for a mid-late afternoon lunch at The Bohri Kitchen (TBK). 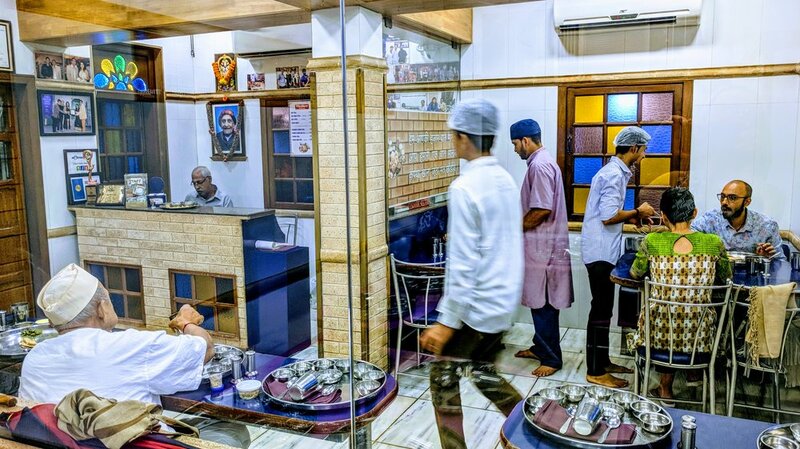 Tucked away on a leafy residential block near our hotel, this “home kitchen” establishment is leading the way to bring awareness of authentic Bohri cuisine to an audience outside this community of Gujarati Muslim traders. TBK is the brainchild of Munaf Kapadia, a former Google account strategist whose original intentions were to help his mother find a hobby. It is said that the Bohra community lives according to the belief that "many hands are a blessing", which applied to mealtime refers to communal eating. We will dine together around a steel thaal that holds the rich and sumptuous courses for sharing. 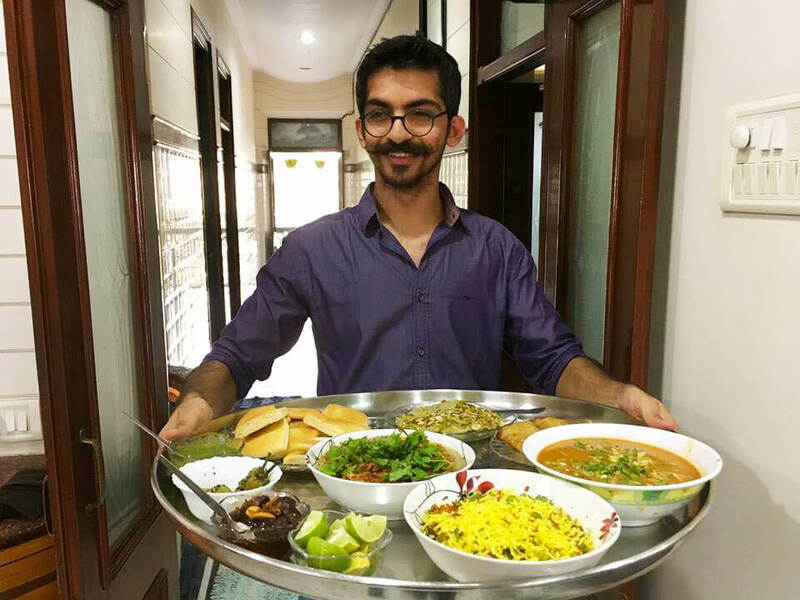 When we say goodbye to Munaf and his family, we leave their home with insights about a culture that was unknown to most of us until lunch was served. Some of us might opt to rest after our Bohri feast, but we will come together for an evening soiree at a private home. Invited guests will include a number of luminaries from Mumbai’s arts, cultural and intellectual circles. Starry, starry night indeed! On this third day in Mumbai, we will take a walk down memory lane with Floyd in the neighborhood where he grew up: Bandra. A highly desirable residential area, Bandra was once a collection of villages inhabited by the indigenous Kolis, a fishing-centric people and the original residents of Bombay. 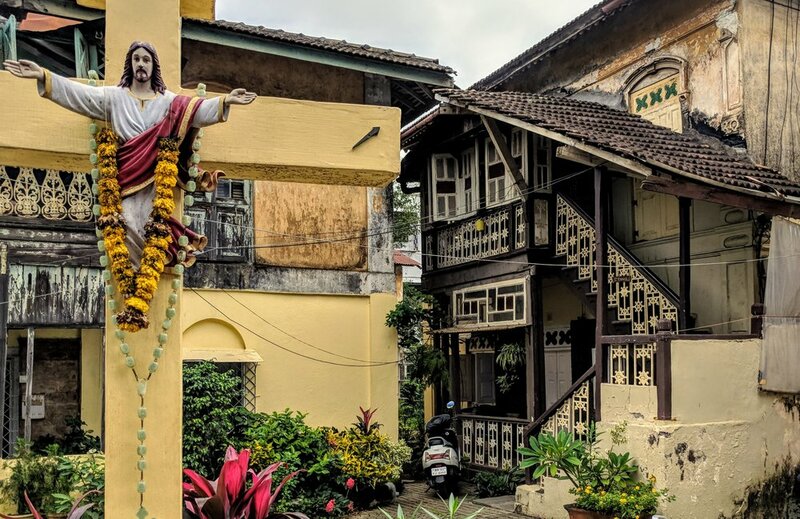 With the arrival of the Portuguese in the 16th and 17th centuries, many inhabitants of the area, in particular the Kolis, were converted to Catholicism, christened as East Indian by the British and together, they formed the backbone of Bandra’s cultural essence. Today, Bandra is home to Bollywood stars, entrepreneurs, writers, families, organic farmers markets, coffee shops, and much more. The vibe is relaxed and low key, hip and cool. Our tour will lead us to historic sights, important churches, heritage neighborhoods and street vendors. Along the way, Floyd will punctuate the historical narrative with personal recollections of the people, food and milestones that marked his early years and influenced who he is today. While Bandra is Floyd’s childhood home, Goa is where his family roots lie and the inspiration for his newest restaurant in Mumbai, O Pedro. 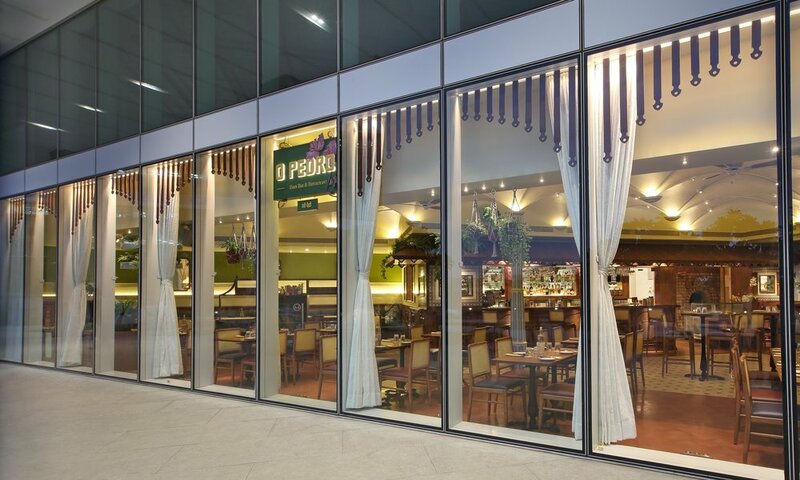 The menu at O Pedro is “Goan-inspired” with authentic regional dishes that are updated in a playful, creative way. The interior is designed to evoke the warmth, light and hygge of a Goan roadside tavern. 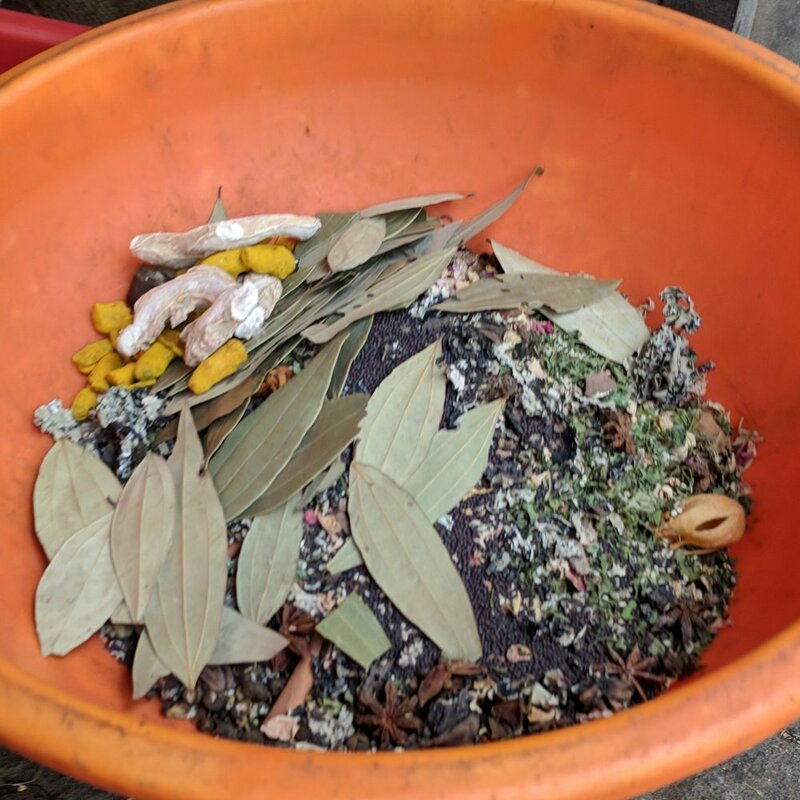 Over lunch we will be exposed to poee, cafreal, xacuti, sorpotel, serradura, bebinca, and learn that vindaloo does not resemble the one we have grown up eating. We will taste how vinegar and heat from chilis live in symbiosis. A perfect venue for launching our food adventures in Goa! Even for those who claim to dislike shopping, being in India will forever alter such attitudes. That’s why we are devoting the rest of the day to exploring the endless variety of textiles, jewelry, handicrafts and antiques that Mumbai has to offer. 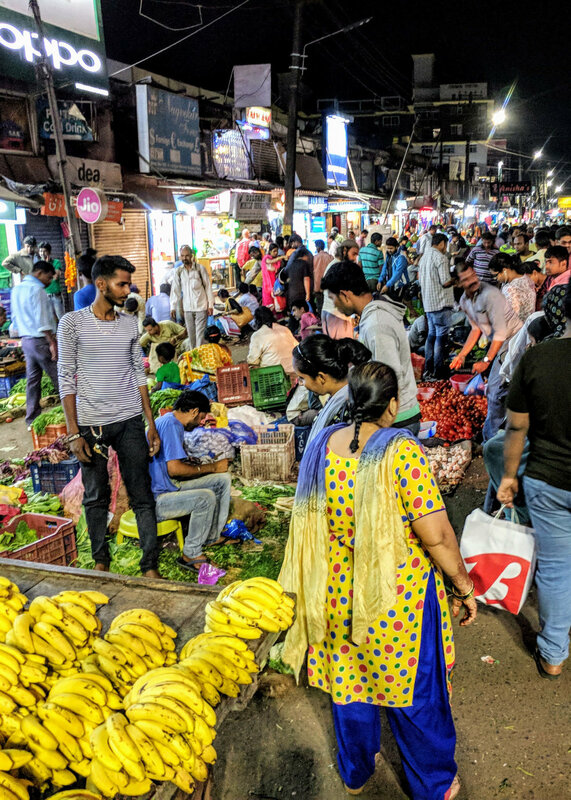 In the evening, our group is invited to a light dinner at Swati Snacks, one of Mumbai’s most beloved institutions, to sample its variations on local street snacks, such as sev puri, bhel puri and pani puri. Our final morning in Mumbai is reserved for an immersive cooking lesson and vibrant conversation at a test kitchen in an area of Mumbai called Andheri, not far from the airport. 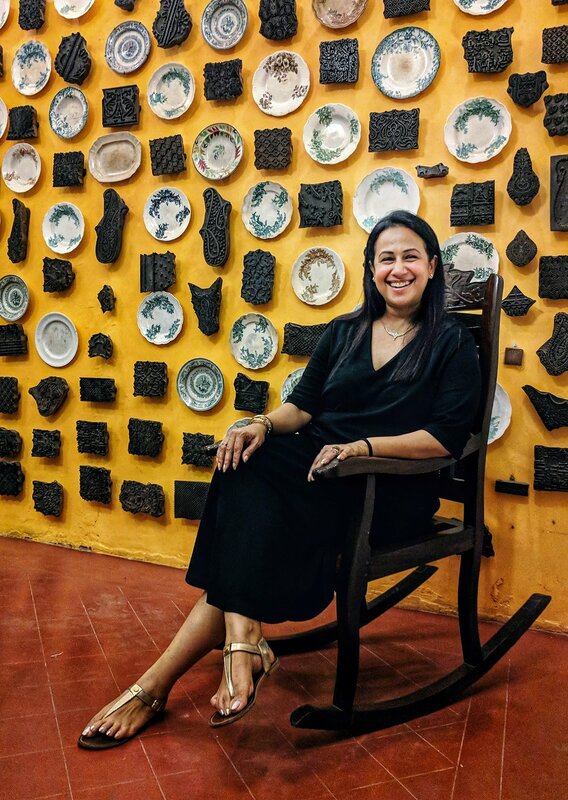 After breakfast at the hotel and with all of our bags packed and loaded onto the bus, we head to APB (A Perfect Bite) Cook Studio to meet owner/founder, writer and culinary expert Rushina Munshaw Ghildiyal. For Rushina, the kitchen represents a place of creativity, social change and empowerment, and she extends this passion to writing about food issues and inspiring children to lead better lives through knowledge of basic cooking skills and healthy foods. The focus of our lesson is dal, one of the mainstays of the Indian table. We will also learn about making pickles and mango chutney. Rushina and her staff will guide us through different ways to incorporate the wide variety of lentils available while also demonstrating the versatility of this legume. A light lunch of dal, rice, bread and vegetables will keep us full until our next destination...Goa! We travel by air to Goa from Mumbai. After arriving at the hotel, we will spend some time to settle into our new surroundings, perhaps take a dip in the pool, relax in the hammocks or retreat into the cool of our villas up on the hill overlooking the Arabian sea and the medieval fort. It’s been a busy day with lots of moving around so for dinner we will not travel far. A short ride from the hotel, Bomras, offers a cuisine change of pace as well. Rangoon born, London trained, Bawmra Jap fuses elements from Burma, India, Laos, Thailand and China and wraps them into a level of taste and presentation that has catapulted this restaurant to the food cognoscenti’s “best of” lists. At breakfast we will be treated to the local bread, poee (pao), delivered market fresh by paowallas on bikes. While poee today is more commonly made from commercial yeast, this morning we will sample the original coconut toddy-laced version. 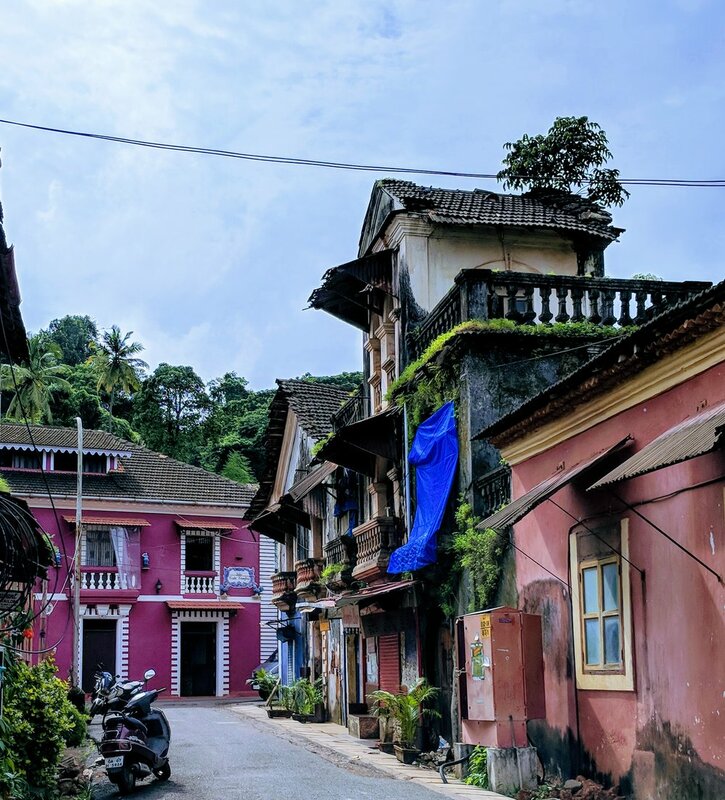 There is probably no better way to jump into the Portuguese legacy than to take a walking tour of Panjim’s historic Fontainhas district. At various stages of restoration and decay, the 18th and 19th century structures lend the area a charm and authenticity reminiscent of other Latin quarters of colonial conquest. 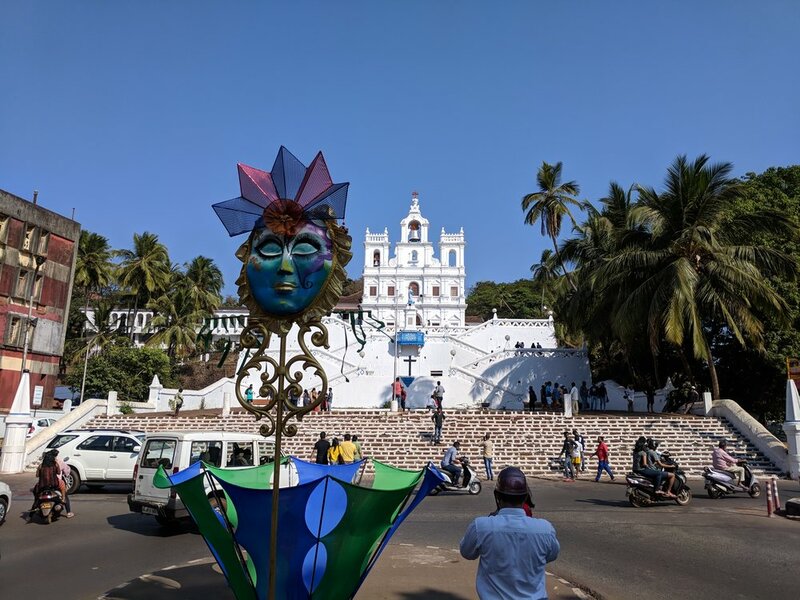 Dazzled by the brightly colored houses, elaborate tilework, mother of pearl shutters and other examples of Portuguese influence, we pass churches, temples, homes, art galleries, cafes, historic inns and stop at a 70-year-old bakery for some Goan sweets. We return to the hotel for an immersive introduction to Goan cuisine by one of its masters. Chef Urbano de Rego’s humility, warmth and understated manner hide the fact that he is single-handedly the most important person to bring Goan home-cooked food to a broad public. In doing so, Chef Rego has helped to elevate awareness of the complexity and diversity of this cuisine throughout the world. His tenure at the Taj Hotels Group dates to 1970 and in Goa to 1974 when he was asked to return to his home state to be part of the team opening the Fort Aguada Hotel. Chef Rego will lead a cooking demonstration followed by lunch to help us begin to understand the ingredients that make Goan food so special and how to differentiate the various culinary strains. Emerging from a blend of indigenous and foreign cultures, the list of influences on Goan food is legion. Hindu, Muslim and Christian communities. Portuguese, Brazilian, African, Arab, Konkan, Malabar. Coastal and tropical. The Portuguese introduced ingredients such as chilis, potatoes, tomatoes and cashews to Goa. They also brought meat, vinegar and bread. Fish and seafood, coconut, rice, kokum, tamarind and local spices were already widely consumed. What emerged as the three distinct cuisines in this small state’s large culinary canon can be classified under Hindu Goan, Christian (or Catholic) Goan and Saraswat Brahmin. The rest of the afternoon will be at leisure. Beach time, sightseeing, spa services, gallery visits, shopping, or just lazing about. We regroup in the evening to step back in time with owner/chef Anisha Hassan of Saligao Stories for dinner. Raised in Delhi, Anisha’s roots lie in Goa and Hyderabad, and her menu, deftly adapted from recipes handed down over several generations, highlights these cuisines. History embraces us amidst the heirlooms, photographs and stories that we will hear from our gracious host who has rightly secured her place in a family long revered for their hospitality. For those in the group who have energy left for a late night drink, we head to Cantare Saligao with Floyd for a cocktail made from the local kaju feni. Cheers and sweet dreams! Our resting place in Goa will be the gracious accommodations and stunning views at the Taj Fort Aguada Resort and Spa. This property will afford us the advantage of being well located, offering a multitude of services and activities and providing a welcome break from the urban pace of Mumbai. After breakfast at the hotel, we head to a 200-year-old organic spice farm called Savoi Plantation. Led by the owner-farmers through this wondrous maze of terraced flora, our walk will expose us to spices in their natural habitat. Cinnamon, clove, cardamom, cumin, coriander, chili, turmeric, ginger, nutmeg, pepper and more. But beware of falling coconuts and men swinging on betel nut trees! Our next destination is Loutolim where we literally step into world of “Portugal in India” at the Figueiredo Mansion. Surrounded by serene fields of rice paddies, coconut trees and egrets, this museum/heritage inn/home has stayed within the same family, the Podiars, Saraswat Brahmins who converted to Christianity and adopted the Figueiredo name. Predating the Taj Mahal, the oldest part of the structure was built in 1590, with the “new house” constructed in the 18th century. 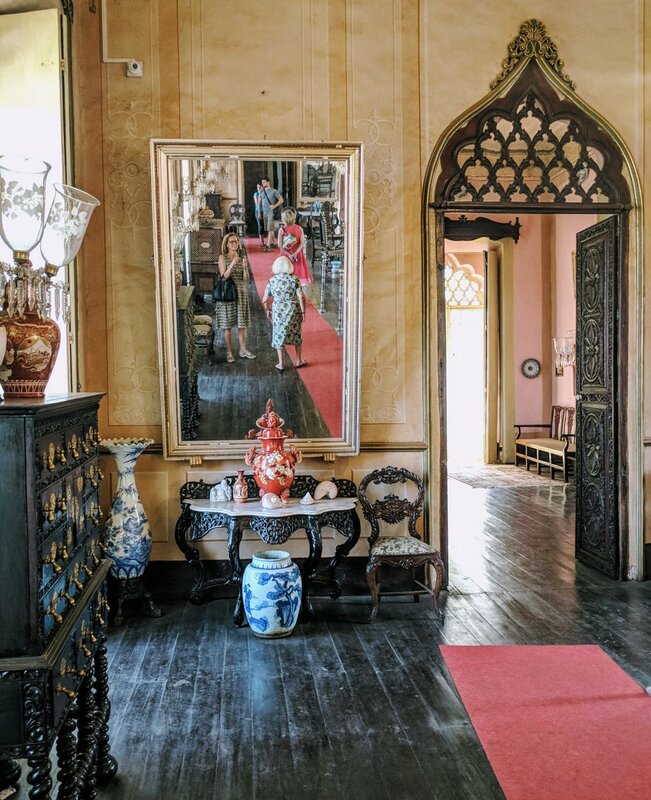 Sumptuous, grand and filled with artifacts and furnishings that tell the story of this prominent and politically connected family, the house is a superb example of the blending of Portuguese and Indian aesthetics of the colonial era. 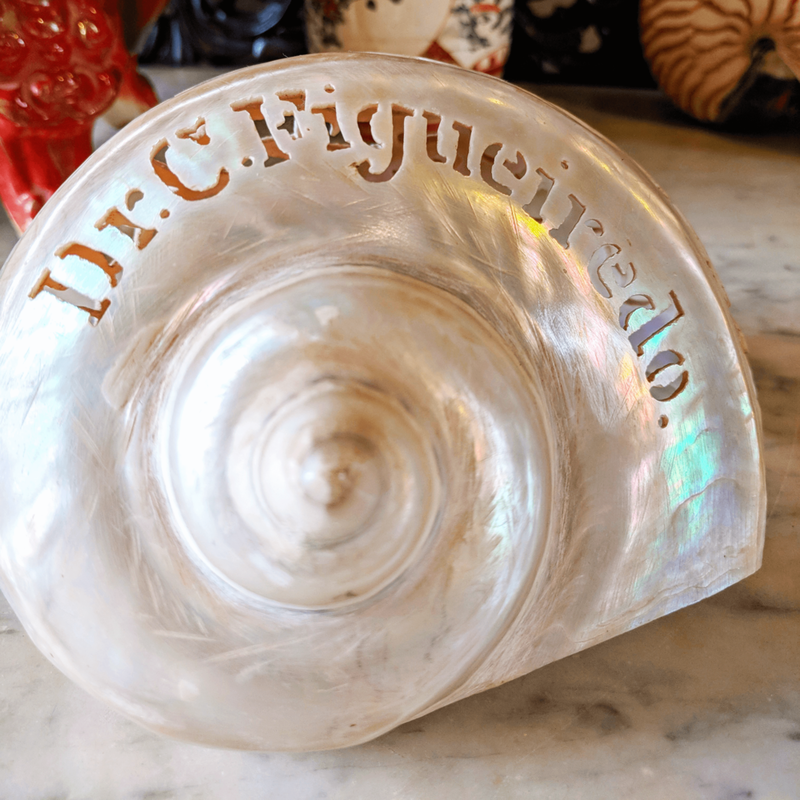 Maria de Fátima Figueiredo de Albuquerque, who with her mother Maria de Lourdes led the charge to restore the mansion, has recently returned to Goa from Portugal after a highly successful corporate career. Fatima will take us on a house tour that ends up in the grand dining room where we will feast on food and knowledge. We are honored to have acclaimed writer, culinary expert and television host, Odette Mascarenhas co-host the lunch with Fatima and present an historical overview of the development of Goan cuisine and what makes it unique. After an active day on the road, we return to the hotel for an evening at leisure. Day 7 – It’s all about the Sea(food)! There is so much to explore in Goa so we are leaving the morning and early afternoon to the discretion of each guest. Sojourns to North Goa, South Goa, Divar Island or Salim Ali Bird Sanctuary are highly recommended. In addition, the hotel offers water sports, rock climbing, yoga and bird watching. We will assist our guests in creating the right activity to suit their interests. Markets in India buzz with unbounded kinetic energy and a kaleidoscope of vendors, produce and products. There is really nothing like being at Mapusa Market on a Friday when this activity supersizes with traders coming from all over Goa. When we head there in the late afternoon, Floyd promises to lead us to some of his favorite spots. For sure, we will locate the strings of homemade Goan chouriço along with displays of fresh bread stacked on wooden poles, resembling Jerusalem bagels without the sesame seeds. Our dinner venue is in Mapusa, a very short ride from the market madness. Owner Atuh Shah greets us at Spice Goa, an unassuming storefront eatery in a small shopping strip just off the Goa-Mumbai highway. Once inside and under Atul’s stewardship, we start to understand why this restaurant has secured its reputation as serving the best seafood in Goa. It is a family affair at Spice Goa. While Atul, also known as “Dr. 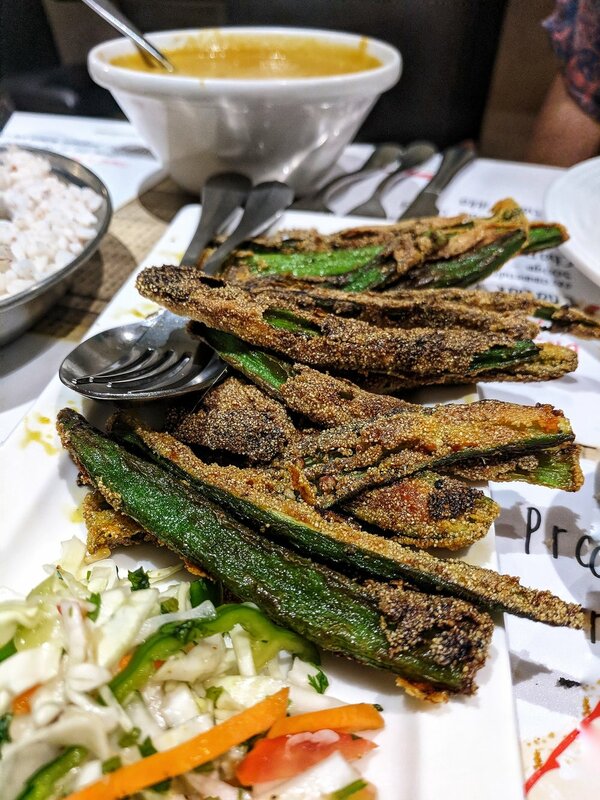 Fish” for his uncanny ability to procure the best ingredients even during the monsoon, is the driving force behind the business, it is his wife Aparna who makes the food sing with her personal masalas, ground fresh every day. The Shahs have designed a meal that will highlight the local, seasonal fish and seafood, vegetables and other specialties of the house. By now we will be familiar with Goan preparations such as xacuti, recheado and peri peri, but it is highly unlikely that we have encountered lobsters like the ones Atul will present to us before he sets them ablaze with chili and love. A sweet note for dessert promises to eliminate the sting from our mouths and send us off into the night looking forward to the next “appointment” with Dr. Fish. After a leisurely breakfast at the hotel, we head back in time to Old Goa for a walking tour of this UNESCO World Heritage Site. 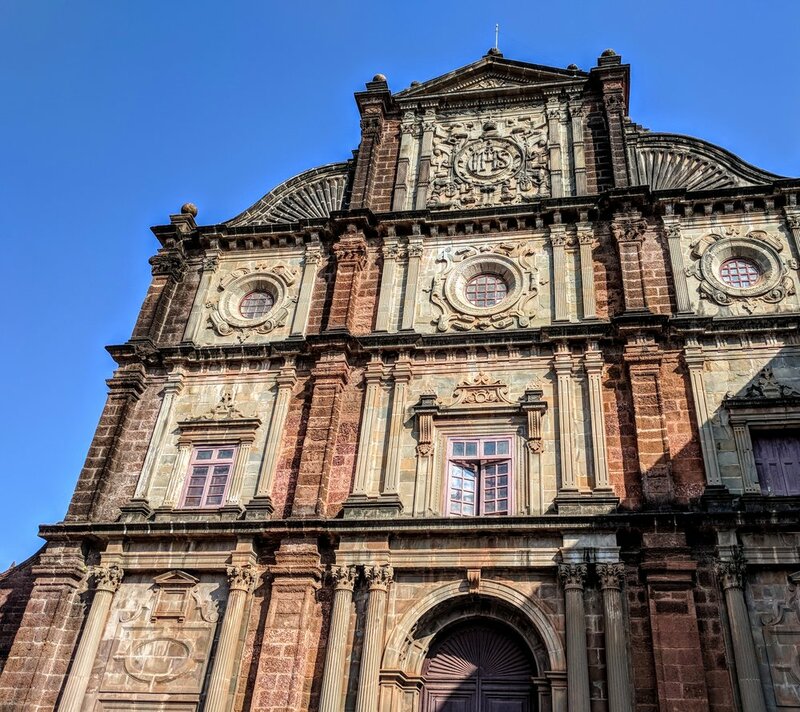 Here, we will encounter the heyday of the Portuguese colonial empire, the 16th and 17th centuries, when the population of Old Goa was larger than either Lisbon or London and the churches were grander. Outbreaks of cholera and malaria ended the glory days in Old Goa, and in 1759, the capital was reestablished in Panaji. By the time we have walked around Old Goa with its dramatic vistas over the river, adjacent islands and distant hills, we will be ready for lunch. 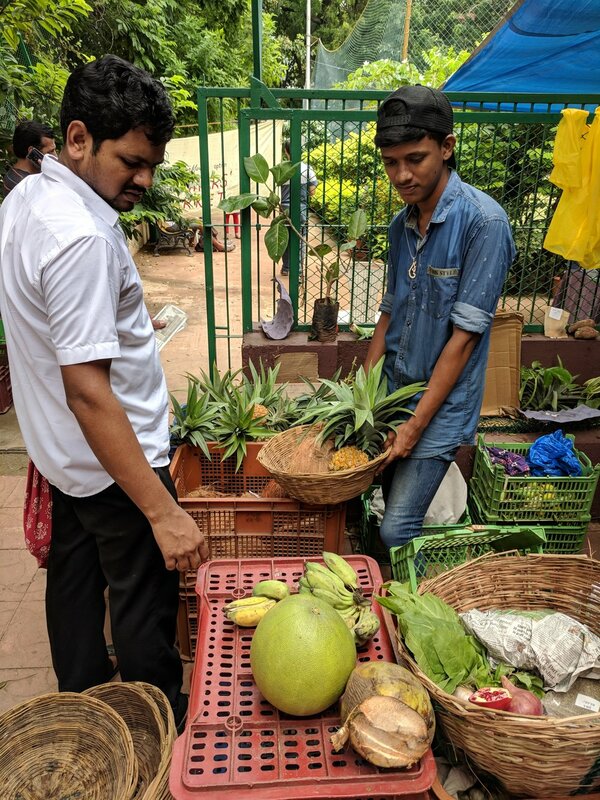 Today, our hosts are the owner, manager and executive chef of Cidade de Goa, where we will learn about the lesser known Goan vegetarian fare and the complex Saraswat Brahmin cuisine. This curated and informative meal will also be accompanied by expert commentary and cooking demonstrations. The complex at Cidade de Goa was designed in the 1980s by Charles Correa, the most important architect of post-Independence India. At this particular site, he wanted to establish a new kind of vacation destination while evoking the sensibility of old world village life. Though better known for his master plans for urban developments such as Navi Mumbai and other significant modern buildings and monuments in India and across the world, Correa, a Roman Catholic of Goan descent, adopted an ironic, whimsical approach at Cidade. Late afternoon break at the hotel. There is nothing more genuine and pleasurable than being invited to someone’s home for dinner. Several of Goa’s most interesting and prominent personalities will join us for an evening of revelry, great food and good cheer – a fitting way to spend our last night together in this enchanting place. Our last morning in Goa will be spent at the discretion of each guest. However, we will come together for a farewell lunch at Bhatti Village before departing for the airport. This modest taverna with Goan Catholic dishes is a popular spot for chefs and locals alike. We will dine on house daily specials of vindaloo, cafreal, fish curry and roast pork while toasting our time in Goa with rounds of the owner’s kaju feni. The airport is our final destination where we bid adieu to Floyd and our friends.